A springtime chill was in the air near New Berlin east of San Antonio on this early April morning. This field of wildflowers was covered in a light frost, but the colors of the blooms still added a beautiful vibrance to the landscape. Phlox (purple), bluebonnets (blue), Indian paintbrush (red), Missouri primrose, coreopsis, tickseed, and groundsel (yellow) spread out across the pasture as sunrise began to bring light and warmth to the land. This panorama is made up of several individual images in order to provide clarity and sharpness for large prints and displays. 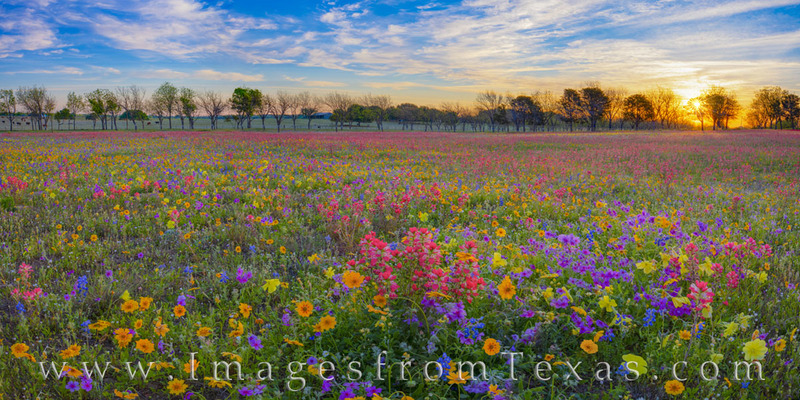 This wildflower panorama is available in larger and custom sizes. This wildflower panorama was taken on private land upon the invitation of the owner.
. Photo © copyright by Rob Greebon.